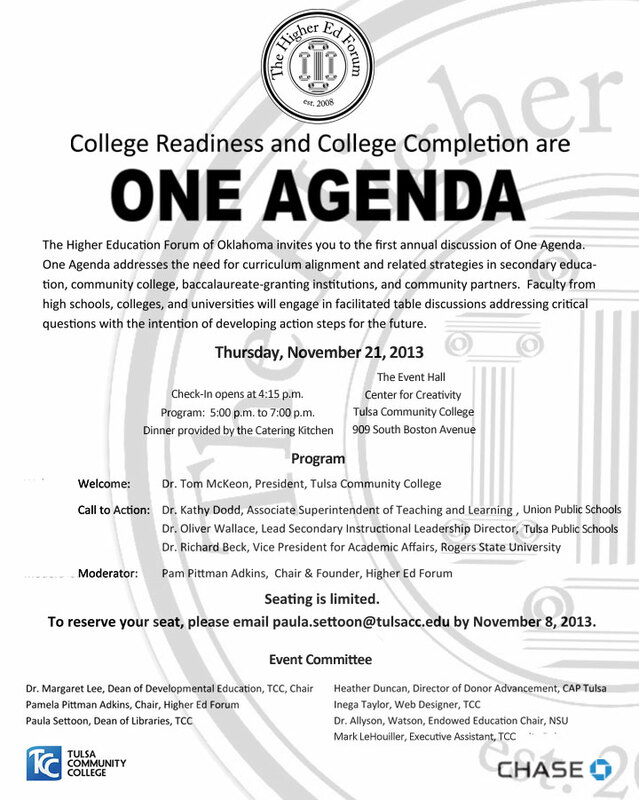 One Agenda is a project of the Higher Education Forum that promotes collaboration among member institutions to increase academic preparedness for college and college completion in Northeastern Oklahoma through explorations of curriculum alignment and related strategies to increase college readiness among high school students and college completion in the Tulsa area. 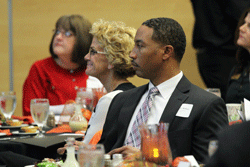 With its proven track record of promoting critical dialogue among member institutions and building relationships among education professionals and community partners in Northeastern Oklahoma, the Higher Education Forum provides an ideal venue for collaboration to align curriculum in K-12 school systems and institutions of higher education. Develop an enduring network for collaboration among Tulsa-area high schools and colleges to increase college readiness among Tulsa-area high school graduates, as measured by high school graduation rates and entering course placement rates at Tulsa-area colleges. Explore curriculum components in Tulsa area high schools and colleges and examine potential pathways to improve alignment. 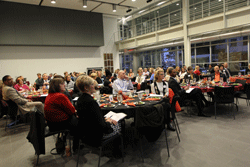 Launch One Agenda with a dinner meeting of education professionals from Higher Education Forum member institutions on November 21, 2013 at Tulsa Community College. 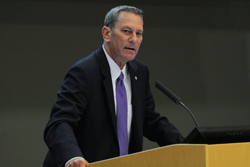 Unmet needs in the workforce, shrinking financial support for public education, and lost ground in student achievement in the US compared with other countries have sounded an alarm among education professionals. Increasing college-readiness among high school graduates and degree completion among college students have correctly assumed top priority. College-readiness and college completion share One Agenda, since college-ready high school graduates are more likely than others to earn college degrees. Recent national research has shown that curriculum alignment through high school and college clarifies educational objectives and promotes learning by eliminating gaps and redundancies in the learning process. The time is right for curriculum alignment, since Common Core State Standards in mathematics and English language provide clear guidelines for high schools and colleges to coordinate student learning outcomes. A streamlined curriculum promises to increase college completion by increasing college readiness among high school graduates. All members of the Higher Education Forum are invited to participate in this initiative.